Click the component on the canvas you wish to customise. The component properties panel will be displayed. A number of media properties will be displayed. The properties available will depend on the media component selected. See below for full details. Once the component has been customised, click anywhere outside of the properties panel to close it. Save the article to apply changes. Selecting an image component displays the image properties tab. 'Add Image' - Upload an image and embed into the image component. 'Crop' icon - Access to the cropping feature. 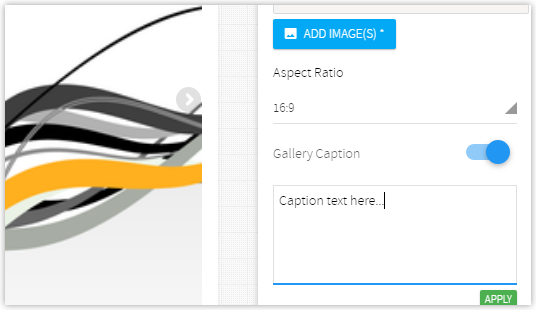 'Caption' - Add a caption to an image, such as crediting the creator. 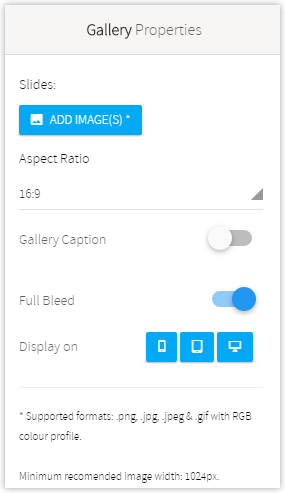 'Full Bleed' - Fits the image to the full width of the page, removing padding. 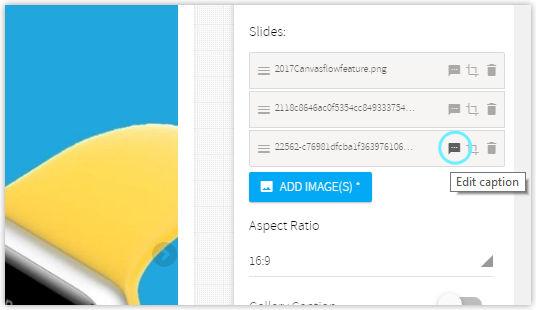 'Use RAW' - Images uploaded to Canvasflow are automatically optimised, selecting to use the RAW image makes use of the original un-optimised file. 'Force Full Width' - Enlarge an image to ensure it fits the entire width of the device it's being seen on. If the raw image is much smaller than the width of the article, some pixelation may occur when using this property. 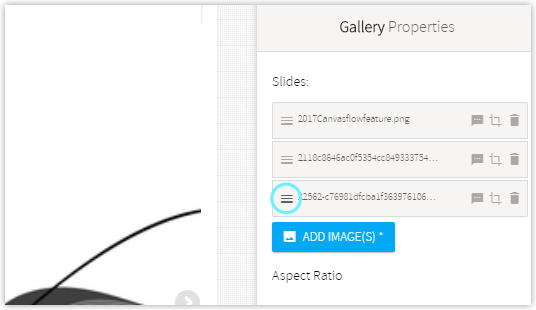 The Aspect Ratio option provides a way to match the aspect ratio of multiple images in a gallery slide. 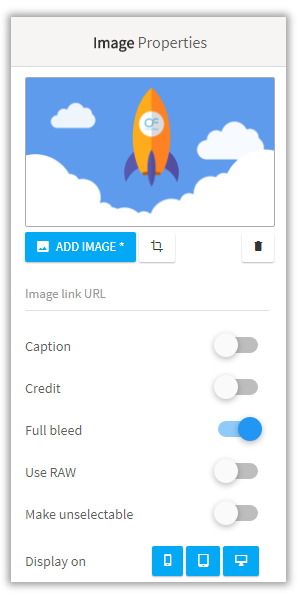 A warning notification will appear next to the upload image in the list if an aspect ratio is selected that doesn't match the upload images. Anchors can be used to allow readers to quickly be able to jump to specific portions of content. 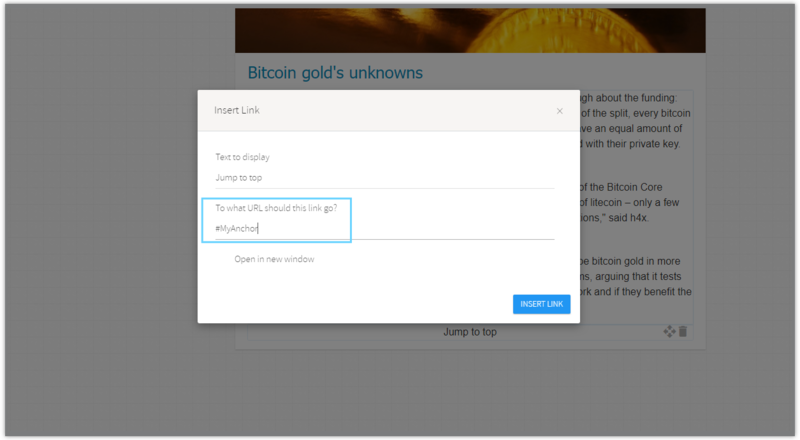 An example of anchor usage would be a 'back to top' anchor at the bottom of a page. The Advert component allows the insertion of a full-page ad. Advert components have the same properties as Image components such as Full Bleed and an embedded link option. Fit Width (Scroll): Scales image to fit device width and create a scrollable page. Note: Due to the iOS toolbar, when using 'Fit Height' the top 64px of a chosen advert image will be partially hidden.